01001011010101.org: Composing and networks, around 2000. 0dB. : The point where an audio signal becomes saturates, and the signal folds into itself. 123rf . Image banc, with low prices. 1984. 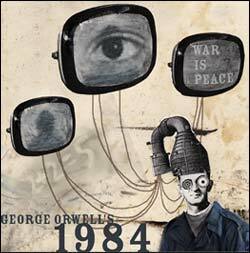 A major book by George Orwell (firsts published 1949, then Penguin editions). 1D, 2D, 3D... See dimensions. 1n0ut . "An artist collective that works both collaboratively and individually on a variety of video and interactive art projects with a focus on generating synesthetic experiences. The artists mix analogue and digital processes in their work to achieve a perfect aesthetic blend which can be understood as a reflection upon all of our lives. Cross-disciplinary by nature, their approaches reach from a self programmed real-time video montage system based on Robert Praxmarer’s ongoing PhD work to the charming photo stills and composed video works from Reinhold Bidner. Both like to think in shades of grey - between black and white - which gives the audience an experience of fuzziness, fault and, despite algorithmic perfection, harmony. 1n0ut works, exhibits and performs on an international level in locations ranging from contemporary art museums, nightclubs to classical concerts and has been awarded with various prizes. " (on Jan. 2014). > 2001, A Space Odyssey. See Kubrick. - By the 80's, about the first computer screens, the term "2D1/2" was used for small bevel effects. Low ED, somehow. - 2D layers stacking, in order to simulate depth (like the Disney multiplane in traditional animation film). 360. "To go 360" (in the 2010's) is to go transmedia. 3D. Three dimensional. See dedicated page. See also Printing. Properties described by [Cocquerez] p. 43, for segmentation and filtering. - Dark ride. . A theatrical space with large curved screens. See [Miller, 2014]. - Film. Wikipedia: "A marketing term for an entertainment presentation system combining a 3D film with physical effects that occur in the theatre in synchronization with the film". - Printing. "4D printing combines the dimension of time with the hope of building objects with new capabiliies" (A 3 pages article in Communications of the ACM, June 2014). 64K into. Wikipedia. A 64k intro is a demo where the size of the executable file is limited to 65536 bytes. At demo parties there is a category for this kind of demos, where the one that gives th e best impression wins. - The point of view of Armand Berger, programmer and manager: "I did not find clear rules for the demos. Then I find the concept rather fuzzy if not smoky. And so more so since today a lot of graphic elements are directly handled by lower software layers (direct X) or the graphic cards". 9 Evenings, Theater and Engineering. A foretelling event: a series of representations at the Armory (New York), in 1966. < 9 evenings, Theatre and Engineering. by Clarisse Bardiot. Online at Fondation Langlois. - Abondant comment in the Nick Lambert PhD thesis. A lot also in Interagir avec les technologies numériques, Nouvelles de Danse. Condredanse, Bruxelles 2004. 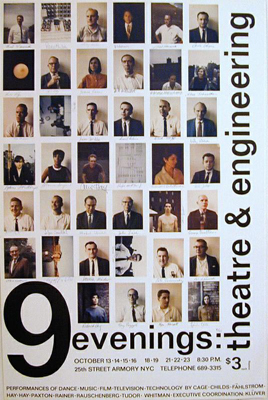 < 9 Evenings reconsidered: art, theatre, and engineering. by Catherine Morris (curator). MIT List Visual ARts Center, 2006. - Participant notes in Interagir avec les technologies numériques, (Contredanse 2004). Among the artists taking part, grouped by Billy Klüver, physic scientist, Bell Labs. - around thirty engineers, mainly from Bell Telephone.